Well, Chipmunks, I promised to report back about my first HTML (web design) homework assignment, and if there’s one thing I do, it’s keep my word. 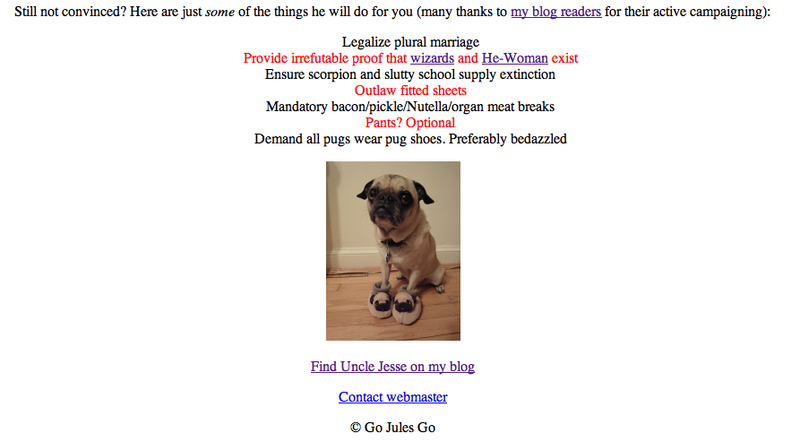 As you might recall, I had to create a basic web page featuring certain elements like an image and a list. Since content doesn’t matter in this kind of class, I thought it was the perfect opportunity to show my eccentric side. And yours. Thank you for your phenomenally weird suggestions. I think we can all agree we made my professor and classmates uncomfortable had fun. Pretty special, huh? In case you’re wondering, the “wizard” link goes here, and the “She-Man” link goes here (thanks, Byronic Man and clemarchives!). Thank god you guys have a sense of humor. Because apparently no one else does. Has anyone else headed back to school this fall? If you could teach any class, what would it be (go ahead, be phenomenally weird again [please])? P.S. – My next web page? I’ve Held My Father-in-Law’s Back Hair. Previous postHold onto Your Hats: My Halloween Contest Starts NOW! Next postFor My Sister: Canvas Print Giveaway! If Hasselhoff had his thong you would have had some company laughing, but the banana-hammock is not universally recognized as amusing. And here I thought my sense of humor had become immodest. Your sense of humor is right where it should be. I mean seriously, who wears a Member’s Only jacket with weiner wrapper swim trunks? He’s a genius in Europe, but here we dress better. That class would be great for one to teach. Uh, no. No it would not be great. Speaking of your FIL’s back hair, does he know you posted about that on your blog? I would teach a class on how to shave your own back hair. Whoever wrote those instructional pages has a special place in my heart. Every now and then I’ll get to a line where they’re just absolutely messing with you. It’s as specacular as David’s chest hair (though not as spectacular as my FIL’s back hair). Nothing will ever be as spectacular as FIL’s back hair. HA! Preach. Oh and I didn’t answer your question before (I swear I would never AVOID such things… heh) – my FIL did know! I got the family blessing before putting up that post. I ain’t no fool. Ummm……huh? did you say something….? or….? No? Well, sorry—gotta go! Oooh. I would up my Teacher’s Pet game so hard, you wouldn’t know what hit you until you saw the divorce papers. I would teach a class on cold-calling people for shy people. People who don’t even like to call for pizza delivery. People whose heartbeats quicken at the thought of calling to make an appointment or to discuss their insurance policy. It would be great. I’d have a room of disconnected phones for them to practice with! Nicki, I hope you like all of us, because something tells me ALL bloggers need that class. Thanks, Lilykins! Uncle Jesse is already cracking down on slutty school supplies with a vengeance. I’m much more concerned about the scorpions. Speaker! Have you been taking Don’t Quote Lily’s Advanced Emoticons class? I’m not mentioning Hugo AGAIN, I’m just saying that SOMEONE who’s a regular feature on your blog might get jealz if you start plastering The Hoff front and center. I can’t believe no one laughed. We they too young? Too old? Ren-zay, while I’m all for not letting facts get in the way of a good story, I swear on Uncle Jesse’s teeny, tiny head (which, incidentally, is full of big ideas*) that I WAS THE ONLY ONE WHO LAUGHED. I would say people range in age from 18 to 60. So no excuse. It was actually bad. I thought I might go into one of those embarrassing fits where you try so hard to supress laughter that it turns into a mess. I was like, why am *I* embarrassed? You people should be ashamed! That’s the funniest shiz I’ve seen all day! *I may have written a song about this. Yeah, what they said. I can’t believe the class wasn’t rolling in the aisles when the Hasselhoff pic was flashed. Are you taking HTML for Zombies? That doesn’t even make sense that no one else laughed. That’s insane. Although if the problem was that they didn’t know who Hoff was, I really like thinking about what kinds of websites they must have the the instructor was in to. I know. I know! I was just telling Renée that it was actually a really awkward moment. No joke – everyone turned and looked at me when I burst out laughing! Like *I* was the weird one! I think the instructor gets it, though. The day that web page isn’t funny is the day I stop bringing up the wizard post. If there are multiple website showings like this throughout the class you just gotta wear ’em down! Those suckers have put up the anti-laugh wall to protect them from what may be their most awkward class, but if you keep chipping at them they will succumb. As far as a class… Hrm, well, that question made me think of that Youtube video that went viral a few years back of a woman who, hrm, I think she was painting the nails of a badger or something. Totally blanking, which is unfortunate because it was very informative and useful and I want to do that professionally! I’m sorry, but if your class can’t find the humor in the Hoff, just tell them to Hoff off! P.S. 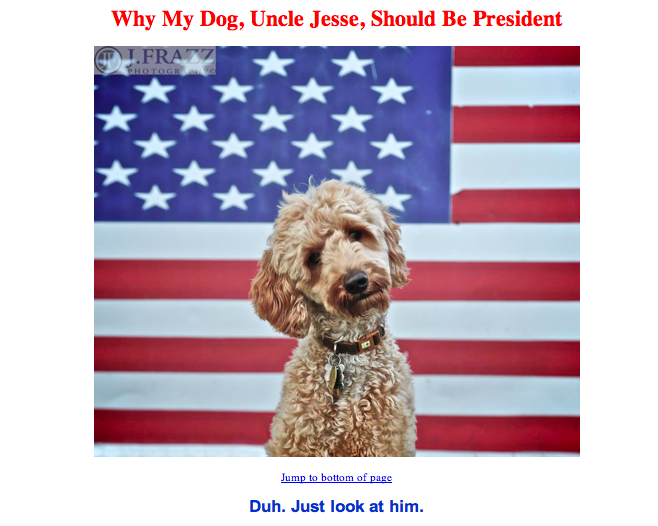 Uncle Jesse’s got my vote! I am so enthralled by your new skill, I can’t tell you. You are doing great! I spent hours…HOURS, on my Parental Hearing Aid post. Not on the writing part – no, I slapped any-old shiz together in a few seconds, as usual. But I wanted 2 columns of “what they say” and “what they hear” with one line across from its counterpart and I couldn’t figure out how to do it to save my life. I’m sure that was the ONLY thing needed to make that the post of the century. Sigh. Wait, are you telling me that nobody else in your class thought that was laugh out loud snorting funny? What are you, in a class with robots? My god, girl! THAT needs to be your next web page…..the art and skill of teaching robots humor! I vote Uncle Jesse every time. I mean, you can’t vote against your lover. I think the David H crotch photo is divinely inspired. Don’t confuse silence on the Hoff as no one caring. There could’ve been some longings stirring up in peoples’ loins that dare not be made vocal. I know this because I’m reading 50 Shades. There are too many serious people out there. Jules, Thank God for the likes of us – who can never be serious about anything. If I could teach a class it would be on how to LIGHTEN UP. Yay pickles! I feel so included. I can’t believe no one else was amused by the hoff. How could they not laugh at the Hoff??? I met him once. Funny story. He is a very friendly guy! How could anyone NOT laugh at David H in that picture? And I thought my local audience was a tough one. Strap the laughing gas on those people already. I would teach a class on 100 uses for wine bottles, corks, and beer caps. Any class? I would definitely teach logic to elementary school kids. I realize their parents might grow to hate me… but the world would be better off. I don’t get it…how is it possible that only you laughed? The HOFF. In a THONG. In the middle of your webpage. It meets all the classic needs of humor. I’m late to the party, but good luck in your class. I’ve thought about doing the same if only so I could get on WP.org. Are you finding it helpful for that? Did you already need basic knowledge?